The current paradigm of toxicology is the identification of precise mechanisms mediating adverse outcome. In recent years, it has become evident that complex signaling and transcriptional networks after exposure to hepatotoxic compounds are critical for initial events triggering cell death and tissue damage. The identification of these mechanisms has the potential of generating precise and sensitive assays for the detection of potential hepatotoxicity of chemicals and medicinal drugs. In addition, they may reveal molecular determinants of increased sensitivity towards hepatotoxic agents, thus allowing a more precise hazard assessment. A further challenge in toxicology is the implementation of improved in vitro systems that faithfully reflect all mechanisms of toxicity in vivo, including modifications of primary hepatocyte cultivation systems and improvements of protocols for stem cell differentiation into hepatocyte-like cells. The research group LivTox is facing these challenges by applying transcriptomics/ bioinformatics and molecular biology techniques, to identify the most important modulators on the transcriptional regulatory networks activated in mouse liver after acute liver damage with model hepatotoxic compounds such as acetaminophen and CCl4. In addition, we also apply these techniques to understand the mechanisms controlling the differentiation state of primary hepatocytes in culture and in stem cell-derived hepatocyte like cells. Our work has revealed important novel aspects in hepatotoxicity. First, we unraveled the precise time-dependent activation of gene networks and biological motifs after acute liver damage. This revealed an unexpected role of the endoplasmic reticulum-stress transcription factor CHOP in liver regeneration. 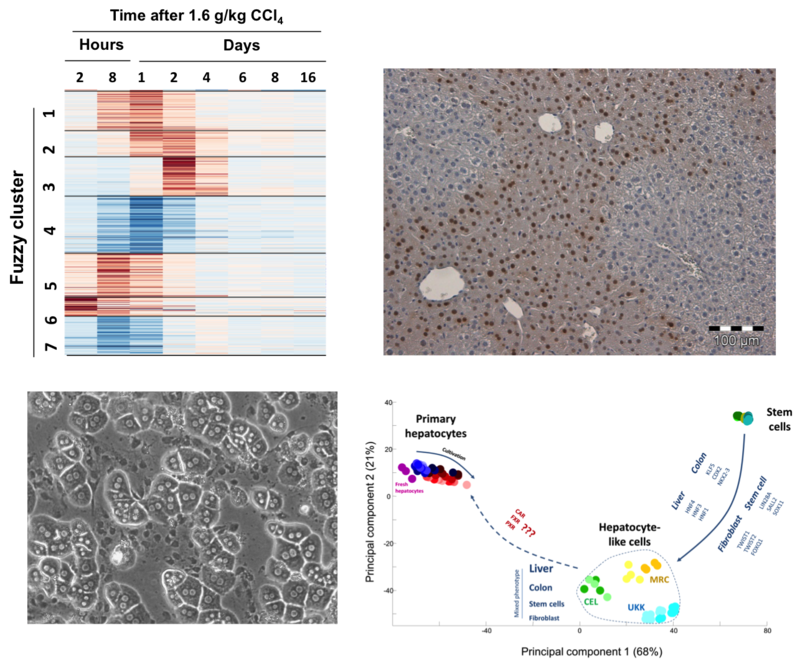 Second, we identified the most important gene regulatory principles controlling failed hepatic differentiation of stem cells, which largely overlap mechanisms inducing dedifferentiation of primary hepatocytes in culture. Third, we discovered a new factor with high relevance for the sensitivity to hepatic injury caused by intoxication with CCl4, namely the Wnt-induced secreted protein-1 (WISP1). These research programs are conducted in close cooperation with the research group ‘Systemtoxicology’, the junior research group ‘Cell Toxicology’ and ‘Liver Toxicology’ of the ‘Department of Toxicology’ and the ’Department of Immunology’, as well as with partners in Germany and the European Union and Chile.